Fizzy drinks are packed with calories, but unfortunately do not make you feel less full, making them one of the worst things for your weight. Despite this, sugary drinks are the top calorie source in American teens' diets, and half the population in U.S. consumes these beverages daily. The lack of fullness results in consumers not cutting back on calories elsewhere, so calories ingested in a sugary drink are almost always “surplus,” adding to weight gain. The bad news is, “diet” or “light” alternatives to sugary and fizzy drinks are not going to reduce weight gain either. The reason a “diet” drink is one of the drinks that make you gain weight is because of the artificial sweeteners it contains. Many studies have demonstrated that sucrose substitutes - such as saccharin, aspartame, and cyclamate - have an adverse effect on the waistline. Part of the reason is chemical: the sweeteners have a weight-increasing effect, and part of the reason is that some people who drink these drinks then feel justified to make up more calories elsewhere to compensate for the perceived reduction of calories being drunk. Whole milk is one of the drinks that make you gain weight because - although it contains many important nutrients - it is also high in fat content. Therefore, a glass of whole milk is much more calorific than its skimmed counterpart. Consequently, it is advisable to drink milk that has a less than 2% fat content if you wish to reap the nutritional benefits of milk. 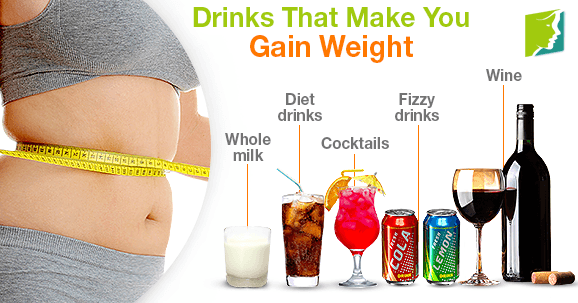 All alcohol contains calories, and those who drink a lot are at a higher risk of becoming overweight. However, some alcoholic drinks are worse than others. There are alcoholic beverages that are have a worse effect on the waistline than wine (such as cocktails), but wine is unfortunately still one of the drinks that can make you gain weight. This is especially true in the case of sparkling, sweet, and dessert wines. To reduce calories while also enjoying wine, it is best to opt for the dry varieties. Not surprisingly, cocktails have made it onto the “drinks that make you gain weight” list. The calorific alcohol combined with the sugary juices is to blame for this, with daiquiris, margaritas, and piña coladas packing well over 200 calories per drink. Read about alcohol and weight gain.